The Horror Section: 100 Per Cent Rad! I just wanted to throw a shoutout to the guys at The Totally Rad Show. Congratulations on one-hundred fantastic episodes! 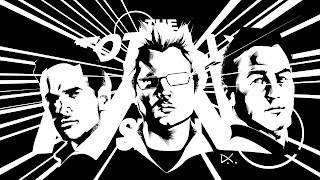 The all-things-rad podcast featuring Diggnation's Alex Albrecht, Jeff Cannata and Dan Trachtenberg (and soon-to-be-leaving-man-with-the-plan Steve Koncelik) first hit the web on March 27, 2007. My friend Phil & I look forward to each weekly episode as much as anything on traditional television. Keep up the great work guys. Here's to one-hundred more!